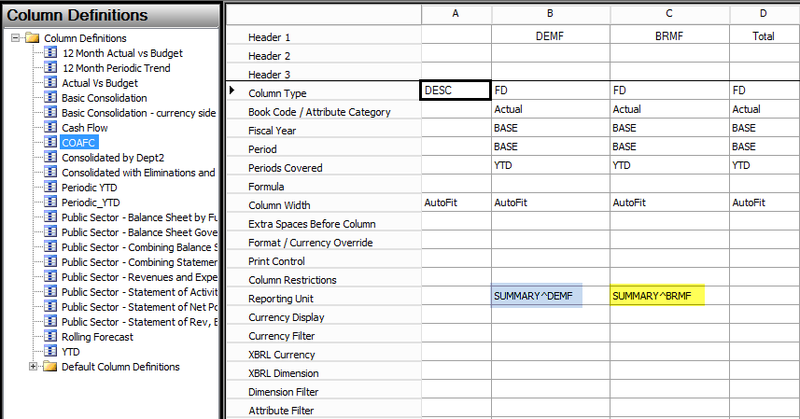 How to avoid small (penny) differences on customer accounts? 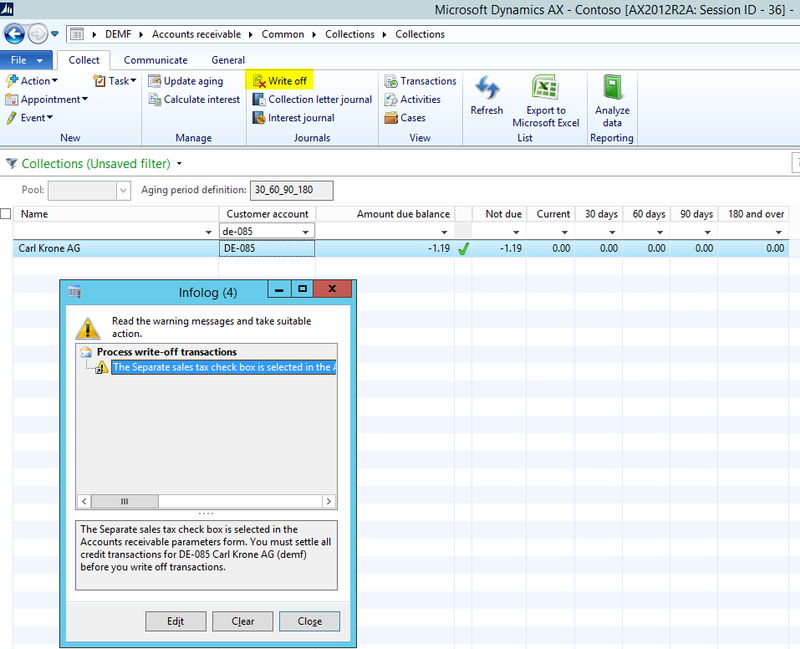 ≈ Comments Off on How to avoid small (penny) differences on customer accounts? This post deals with the question how small (penny) differences on customer accounts can be avoided that arise when customers pay short. 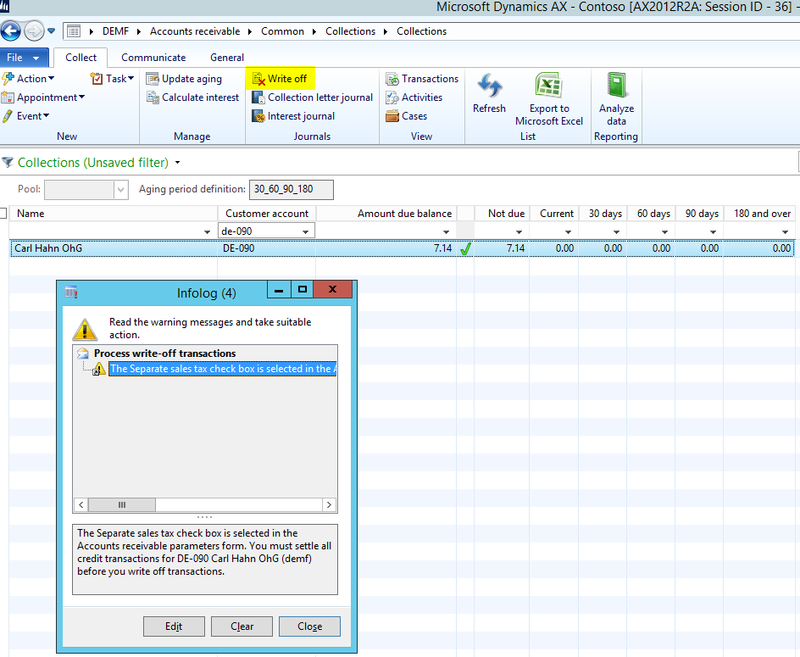 Please note that the following descriptions and illustrations do only apply in Dynamics AX environments that do not make use of the automatic Accounts Receivable settlement functionality. That is, in systems that do not have the Accounts Receivable parameter “automatic settlement” activated. Let’s have a look at the issue of small (penny) differences on customer accounts and how they can arise. 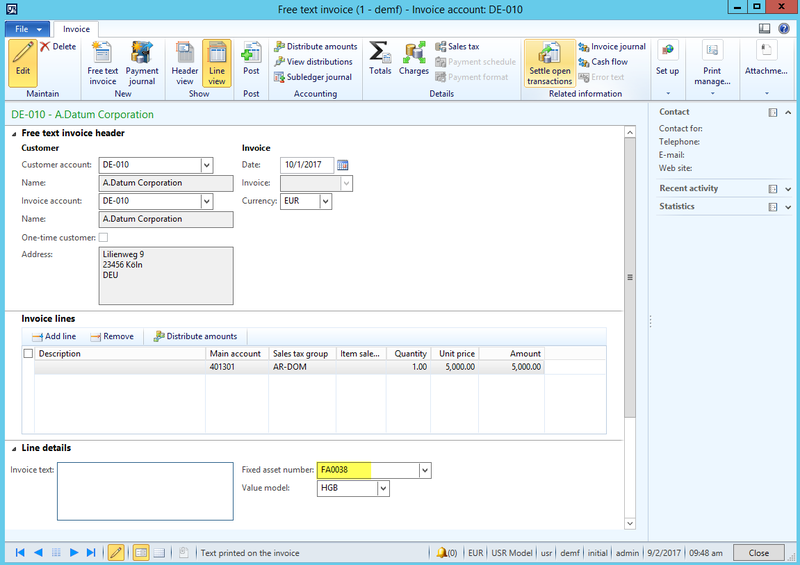 The next screenshot shows you a customer transaction that was generated when a free-text invoice for a total amount of 5000 $ was posted. Once the invoice becomes due, the customer pays 4995 $; that is, the customer pays 5$ short. The customer payment is recorded in a customer payment journal by entering the payment amount of 4995$ and marking the invoice that is paid. Please see the next two screenshots for details. What you can identify from the previous screenshot is that a small value balance of 5$ remains open. If you do not want to chase your customers for those small (“penny”) differences, the question arises what you can do with those small open customer balances and how they can be avoided altogether? 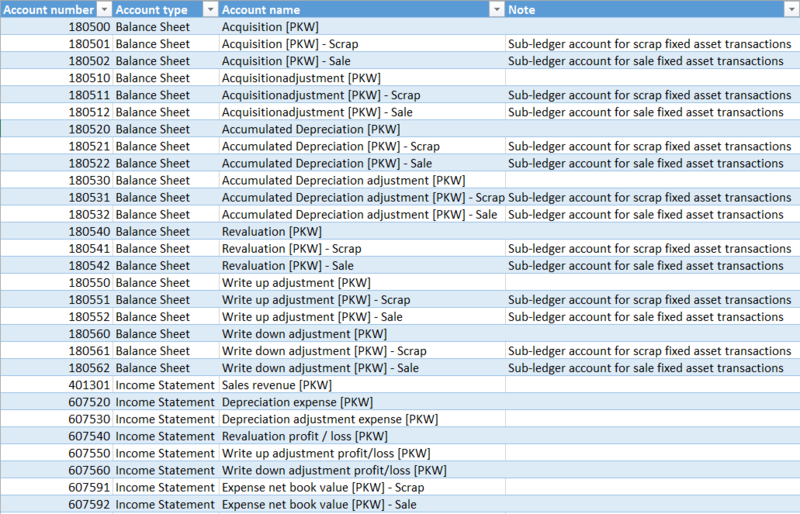 In order to “clean” small value customer balances you can setup a customer pool and write off the small balance amounts. 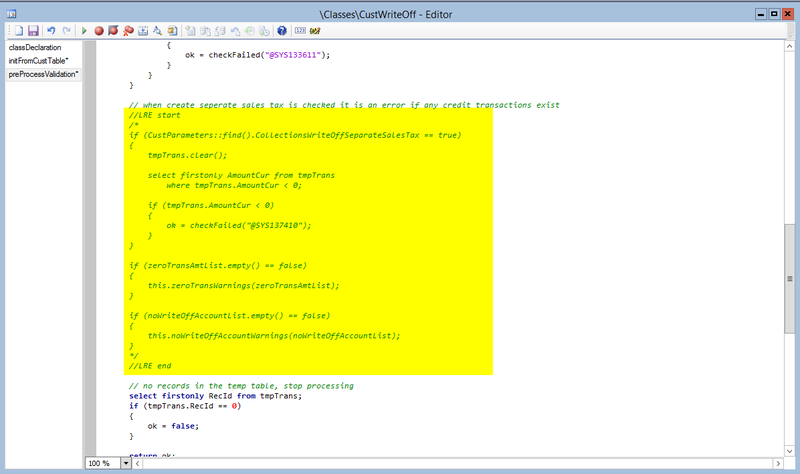 The next screenshots illustrate you how this can be achieved in a standard Dynamics AX environment. 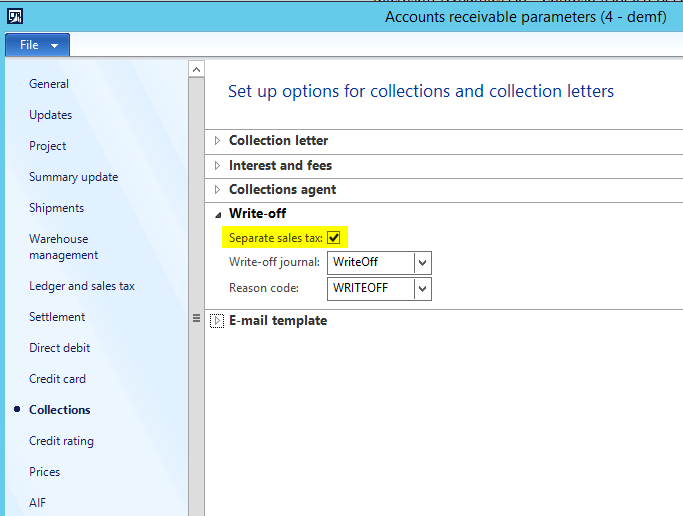 Step 3: Open the collections list page, select the small balance customer pool setup, select all records and click “write off”. 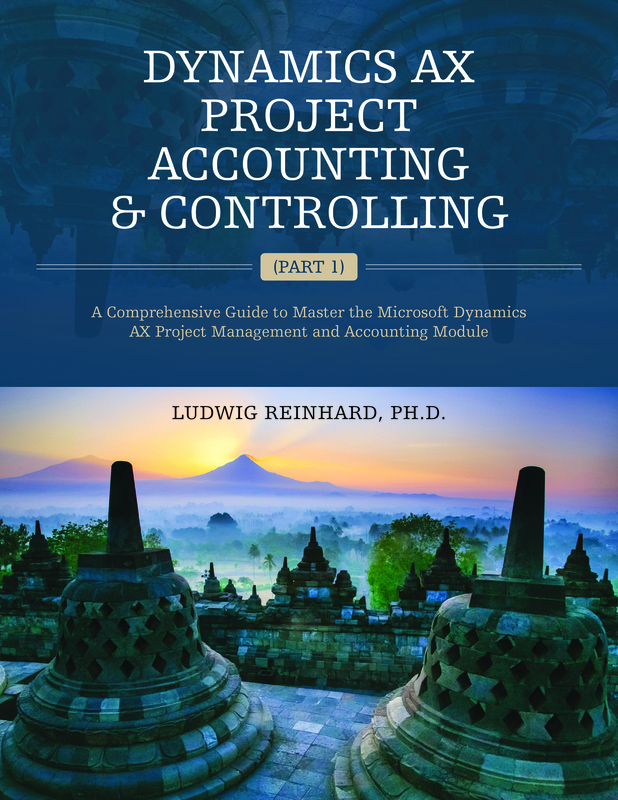 To avoid small value customer balances altogether you can make use of the full settlement functionality that is available for Dynamics AX companies operating in Germany, Austria and Switzerland. To make this feature available in your country environment, simply open the CustOpenTrans form and either delete all country codes in the CountryRegionCodes field or add your country code there. The next example illustrates the outcome of this system modification. Once the settlement window is opened you can identify a new check box “full settlement”, which I selected. 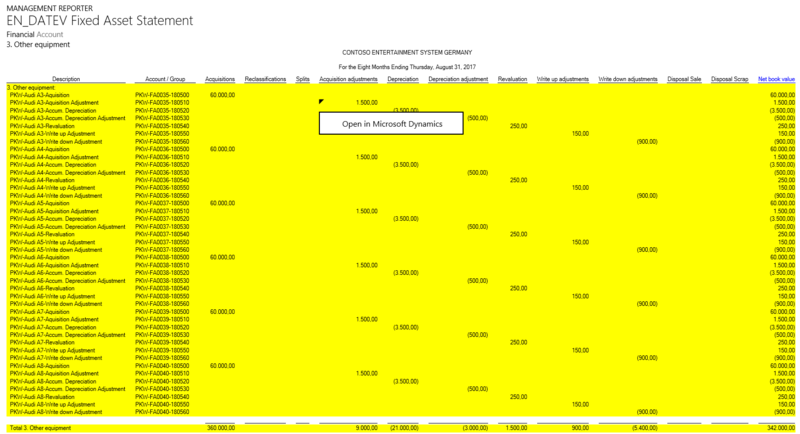 The result of this selection is that Dynamics AX considers the 10$ underpayment as cash discount and posts the underpayment correspondingly by referring to the automatic posting accounts setup in General Ledger. If you double check the customer transactions form you can identify the 10$ cash discount posted. What you can also identify from this form is that no balance remains on the customer account from this transaction. 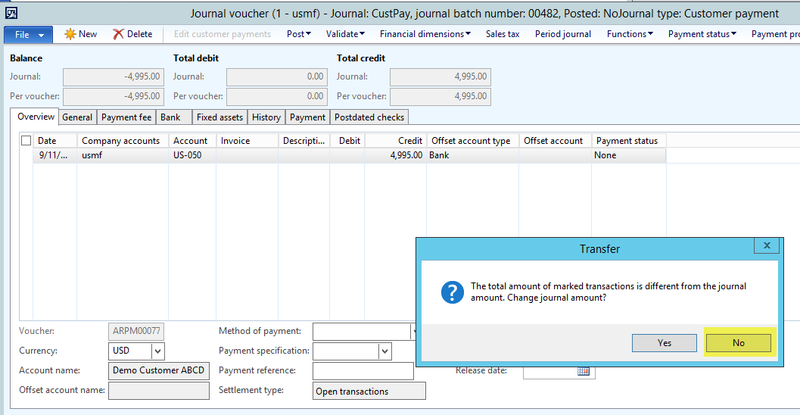 Final remark: Please note that the full settlement functionality can also be made available for vendor transactions simply by modifying the VendOpenTrans form as illustrated above for the CustOpenTrans form. Within the previous posts on vendor prepayments the major focus was on tax issues and how to ensure that they are posted correctly when recording vendor prepayments. In this post I would like to focus on the disclosure of prepayments in a company’s balance sheet and the differentiation between requested and paid prepayment amounts. That is, at the time vendor prepayment invoices are recorded in AX they do not constitute a right/receivable against the vendor who sent the prepayment invoice, as no exchange of goods/services occurred. The right (receivable) that your company has against the vendor arises at the time when the payment to the vendor is actually made. For that reason, some companies prefer separating “requested vendor prepayments” – that do not establish a right against your vendor – from “realized” vendor prepayments that constitute a legal claim against your vendor, as the prepayment invoice has been paid. 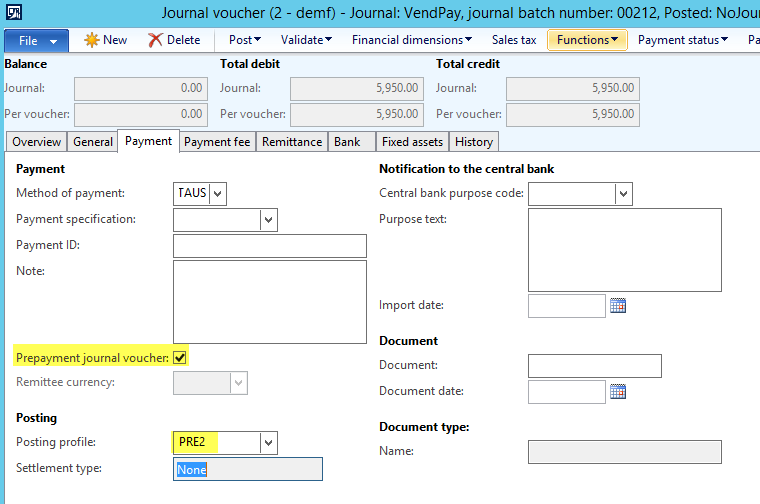 The problem with the separation of requested from actually made vendor prepayments is that Dynamics AX does not provide a functionality that automatically generates a corresponding voucher at the time the prepayment is made. The following illustration that is based on the examples used in the previous posts explains the issue. What you can identify from the illustration above is that an additional ledger transaction that debits the vendor prepayment account and credits the requested vendor prepayment account is required at the time when the payment of the prepayment invoice is made. 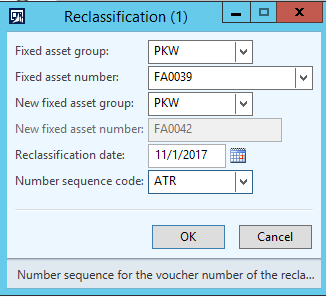 As the standard Dynamics AX features do not support the required Transaction, you can either implement a system modification or use one of the following workarounds. A first option for separating requested from made prepayments is creating a manual General Ledger entry based on an inquiry of the prepayment transactions recorded. The following example demonstrates this procedure. 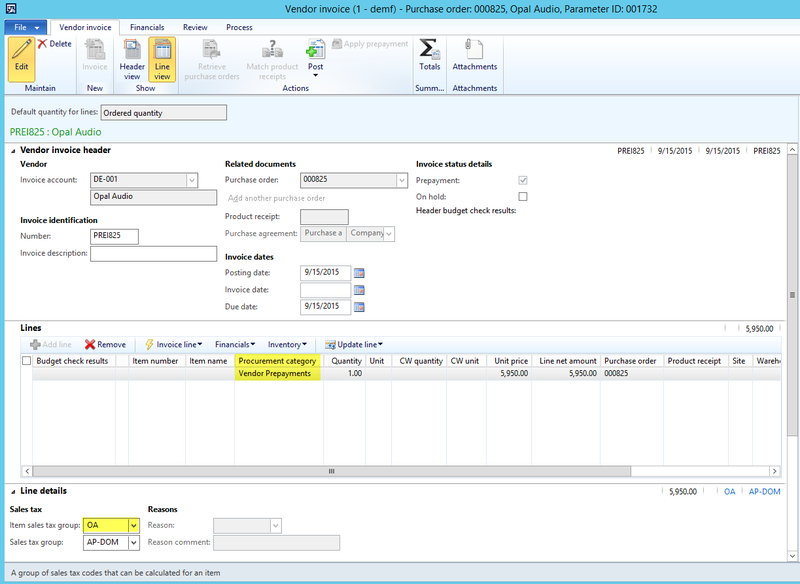 For the following illustrations, three purchase orders with prepayment amounts of 5000 EUR (5950 EUR), 2000 EUR (2380 EUR) and 6000 EUR (7140 EUR) are recorded in Dynamics AX. (Note: the amounts included in brackets represent the gross prepayment amounts incl. 19% VAT). 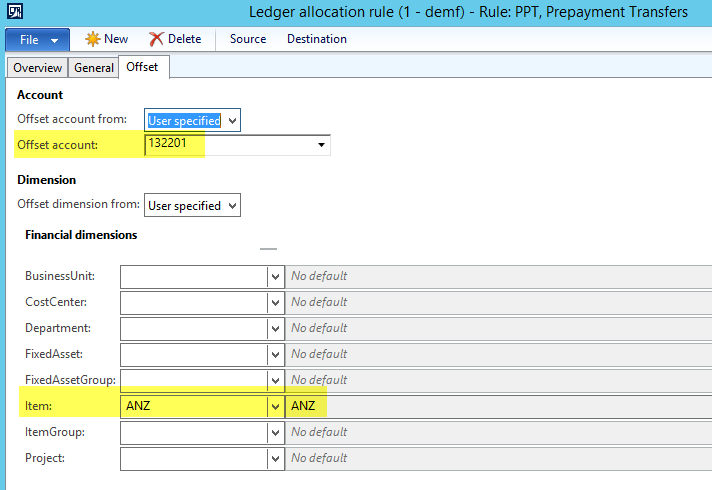 The prepayment invoices are recorded as described in the second post on vendor prepayments by using two service items (“ANZ” and “ANZVERR”) as illustrated in the next screenshot. Please note that the service prepayment items (“ANZ” and “ANZVERR”) are setup with their item number as financial dimension value. Also note that the ledger setup of the first service item differs from the earlier posts and does now refer to the requested prepayment account no. 132201. 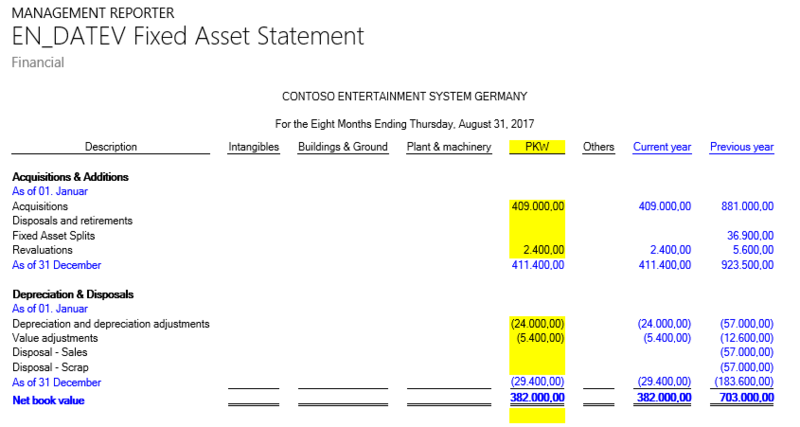 The next screen-prints shows the prepayment invoice amounts posted together with the corresponding amounts that have been paid to the vendor. Against the background of this summary and the transactions recorded in AX, 6000 EUR need to be transferred from the “requested prepayment” account No. 132201 to the ordinary prepayment account No. 132200. 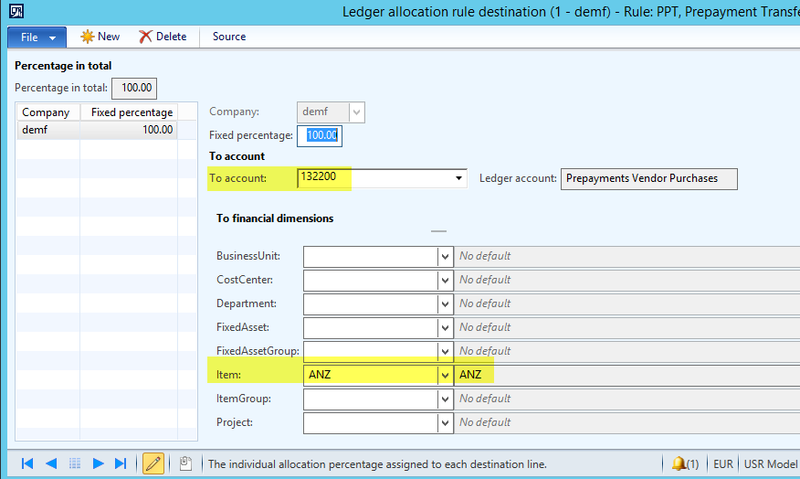 The amount that needs to be transferred can be identified from the sum of the ledger accounts 130850, 132201 and 200100 filtered by the “ANZ” item financial dimension. 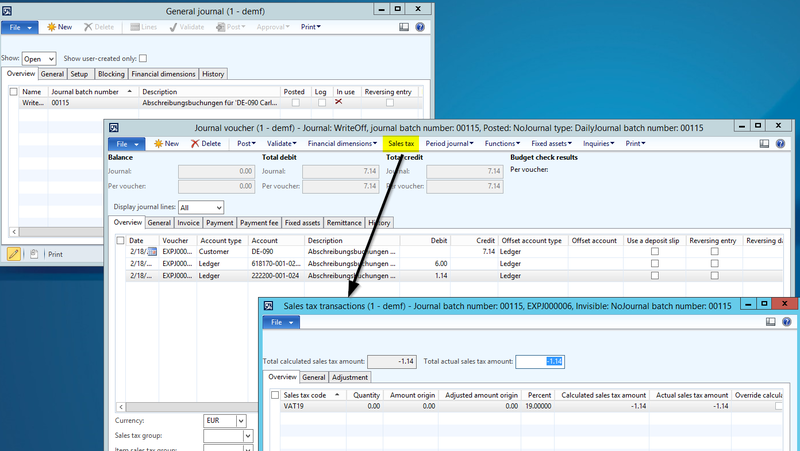 The next screenshot shows the necessary (manual) ledger transaction that needs to be posted. In the previous screenshot, the lines highlighted in blue color represent the prepayment invoice payments made to the vendor (6000 EUR net + 1140 EUR VAT = 7140 EUR) that allow a VAT deduction of 1140 EUR. 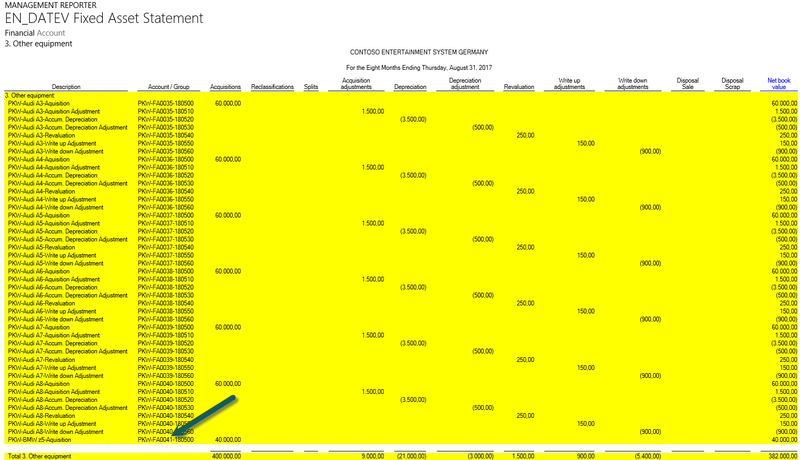 The lines highlighted in yellow color represent the prepayment invoices posted but not paid. For that reason, the VAT related to those invoices cannot be deducted yet. 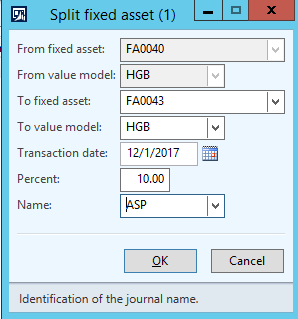 If you do not like creating manual journal entries, you can setup an allocation rule as shown in the next screen-prints that does the calculation and posting job for you. The outcome of the second workaround that uses the allocation rules for making the transfer postings is of course identical to the one realized via the first workaround. Yet, the second workaround allows you repeating the allocation transaction as often as required with almost no effort required. This post concludes (for now :-)) the posts on vendor prepayments. I hope you enjoyed the series and look forward to seeing you in the next posts. 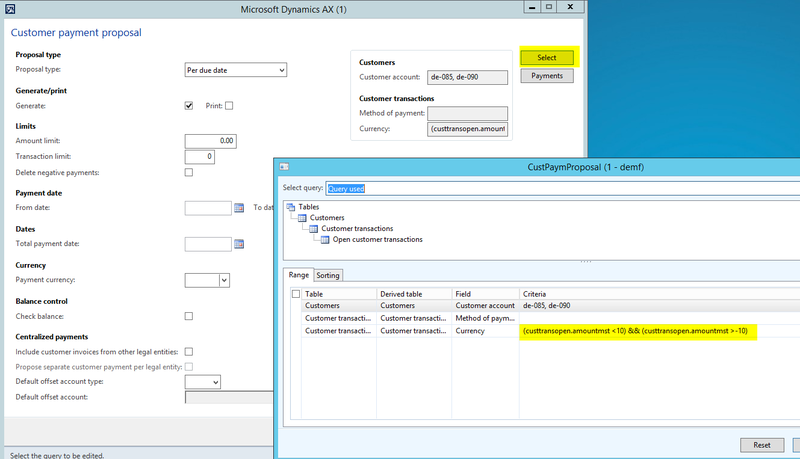 Within this post I want to introduce you another alternative approach for recording vendor prepayments in Dynamics AX. This approach differs from the ones introduced in the earlier posts by the fact that no prepayment invoice is recorded initially but that the process starts directly with the payment of the prepayment amount requested by the vendor. In order to make this approach work, I setup the following new vendor posting profile (“PRE2”). What you can identify from this newly setup posting profile is that the prepayment balance sheet account (“132200”) is entered in the summary account and sales tax prepayment section. As mentioned initially, the alternative prepayment process illustrated here does not require entering a prepayment invoice and thus starts with the setup of an ordinary purchase order and the payment of the prepayment amount to the vendor. 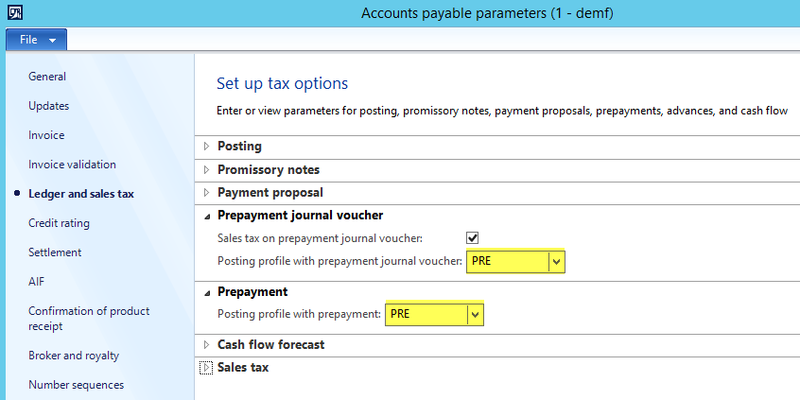 …except that the newly setup posting profile is used when the prepayment journal voucher check box is activated. 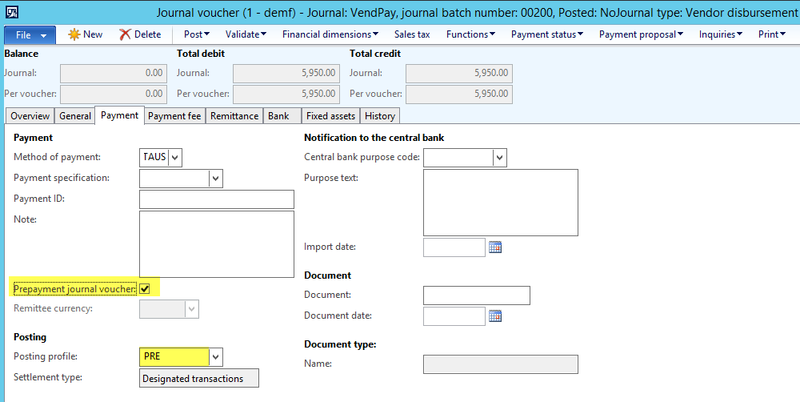 The outcome of this payment transaction is the following voucher that debits the prepayment balance sheet account no. 132200 with a total amount of 5000 EUR (5950 EUR – 950 EUR). What you can also identify from the voucher is that only the ordinary (deductible) VAT account is used, which allows deducting this amount directly. The third and final step requires that you select the prepayment made in the open transaction form of your purchase order. 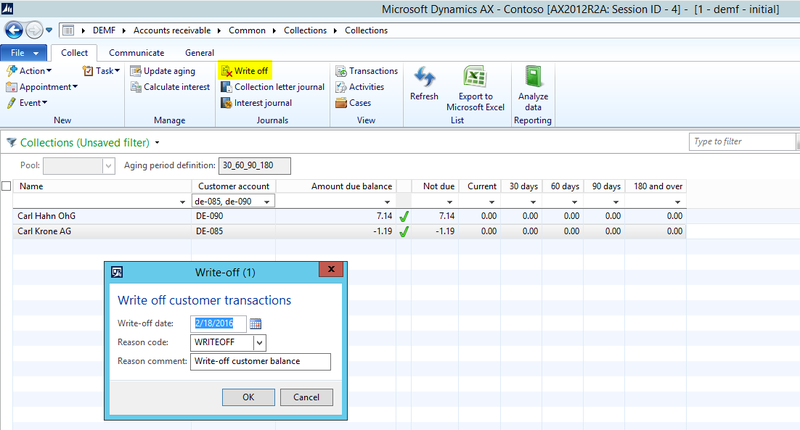 Please note that Dynamics AX indicates that the payment marked for settlement is a prepayment. Once the open transaction is marked for settlement, the final vendor invoice can be posted. The first voucher shown in the upper part of the screen-print records the final vendor invoice and posts a total VAT amount of 4370 EUR. This amount is offset by the related voucher created that offsets 950 EUR VAT. As before, the following illustration summarizes all transactions posted during the prepayment process illustrated. What you can identify from the posting summary is that no temporary (non-deductible) VAT account is recorded. Instead, all VAT transactions are recorded directly on the ordinary (deductible) VAT account no. 130800. For that reason, also this approach ensures that the VAT is posted and deducted at the right time. A major advantages of the prepayment approach demonstrated in this post is its comparative lower complexity and its conciseness. Those advantages do, however, come at the price of several disadvantages. 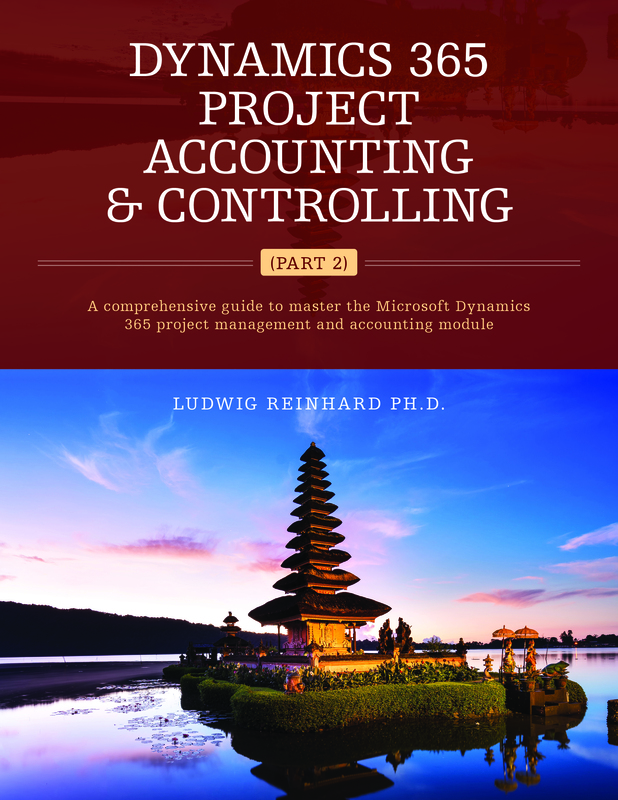 The first disadvantage is that you need to generate an internal document for accounting & auditing purposes to document the prepayment made to the vendor. The second disadvantage with this approach is that you cannot directly identify the prepayments that get deducted when posting the final vendor invoice. As a result, marking all prepayment(s) made for settlement with the final vendor invoice needs to be done with utmost care. 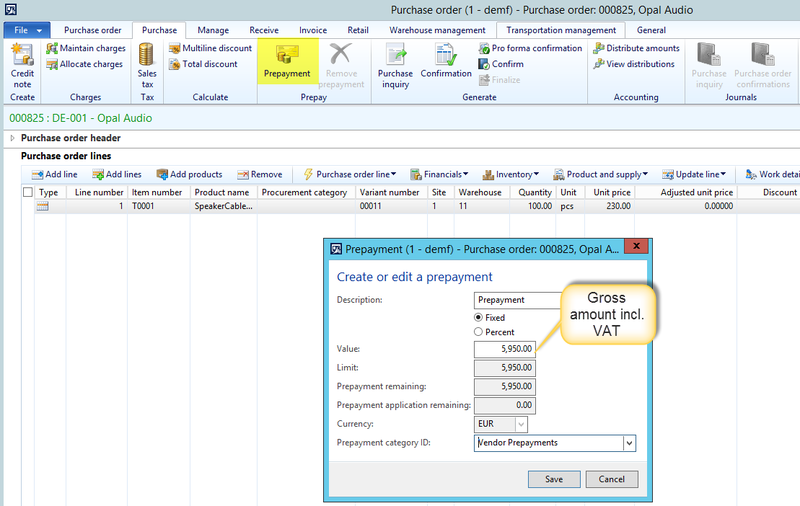 After illustrating you the problems of the standard Dynamics AX purchase order prepayment functionality in a VAT company environment in the previous post, I want show you an alternative approach for recording purchase order related prepayments in Dynamics AX. 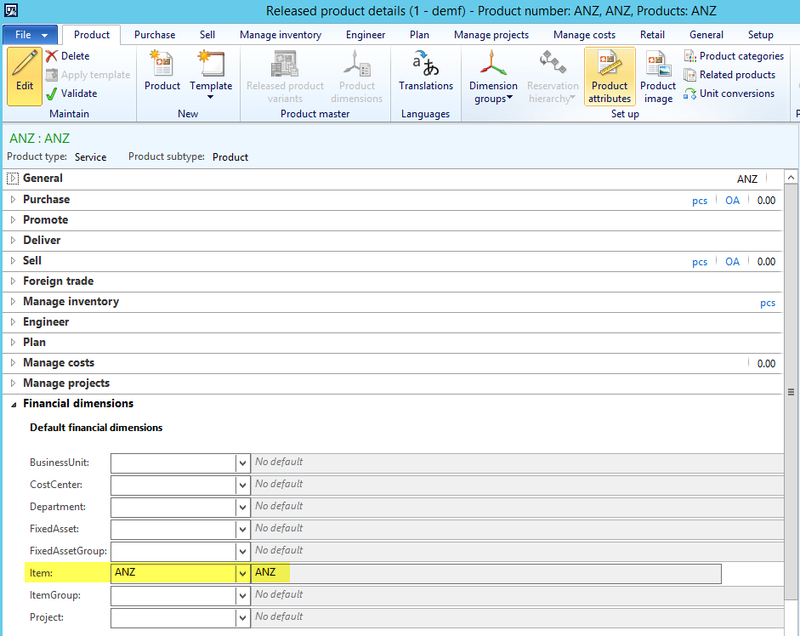 The first service item (“ANZ”) is setup with the on account (“OA”) item sales tax group illustrated in the previous post and is used for recording the prepayment vendor invoice. 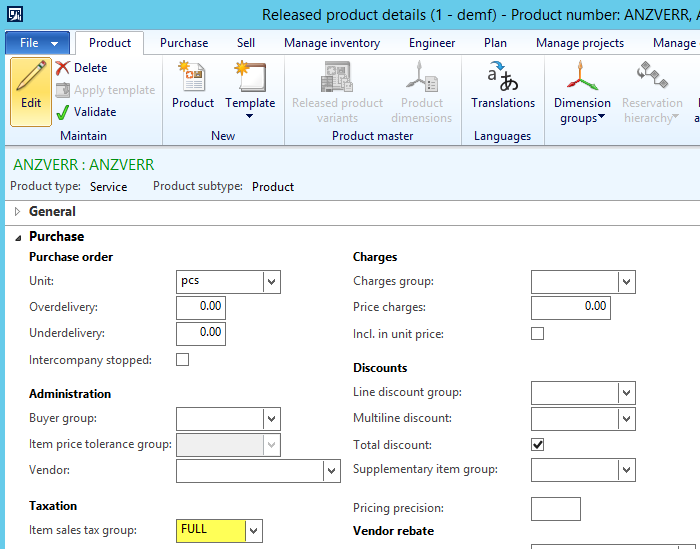 The second service item (“ANZVERR”) is setup with the ordinary (“FULL”) item sales tax group and is used in the final vendor invoice to deduct the prepayments made. 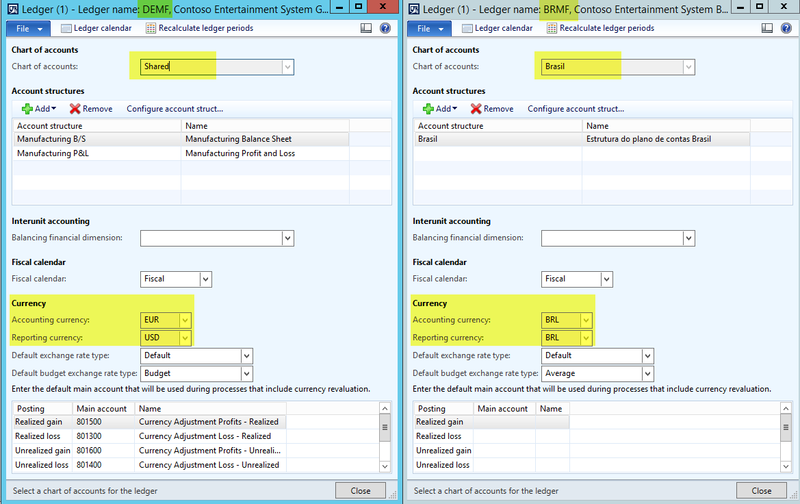 The ledger posting for those service items are posted on the same vendor prepayment balance sheet account (132200) used before but they are setup in a different section of the inventory posting form. For details, please see the next screenshot. With this alternative setup in place, the vendor prepayment process can be performed through the execution of the following four steps. The first step required in the process is setting up the the purchase order. Different from the previous posts, the prepayment is now recorded through two additional purchase order lines. The first additional line holds the first service item (“ANZ”) and is setup with the prepayment amount of 5000 EUR, while the second additional purchase order line holds the second service item (“ANZVERR”) and is setup with an equivalent but negative amount of -5000 EUR. The next step in the prepayment process is posting the prepayment invoice. 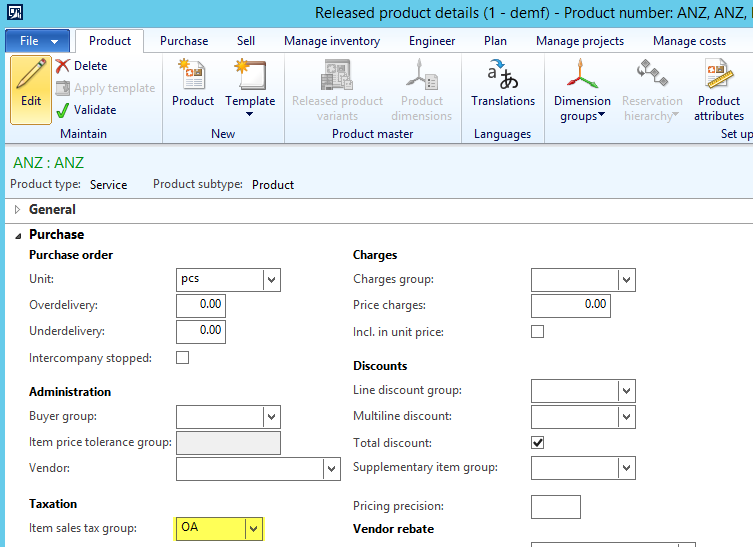 This time the prepayment invoice is posted by using the ordinary purchase invoice form and selecting the first additional purchase order line only. Please see the next screenshots. The outcome of the prepayment invoice posting is a voucher that posts the non-deductible VAT on ledger account 130850. 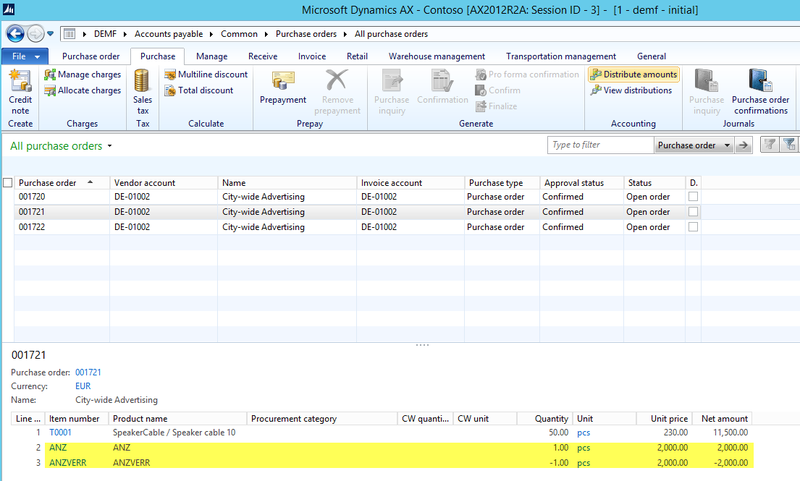 This transaction is identical to the one shown in the previous post on vendor prepayments. Also the third process step – the payment of the vendor invoice – is identical to the one illustrated in the previous post and results in the following vouchers. As before, when recording the payment of the prepayment invoice, a transfer of the tax amount from the non-deductible VAT account (130850) to the ordinary (deductible) VAT account (130800) can be identified. The last step in the prepayment process consists of deducting the prepayment made when posting the final vendor invoice. This time, the deduction is made by including the second service item into the vendor invoice as illustrated in the next screen-print. 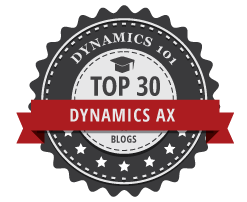 As a result, Dynamics AX generates the following voucher. 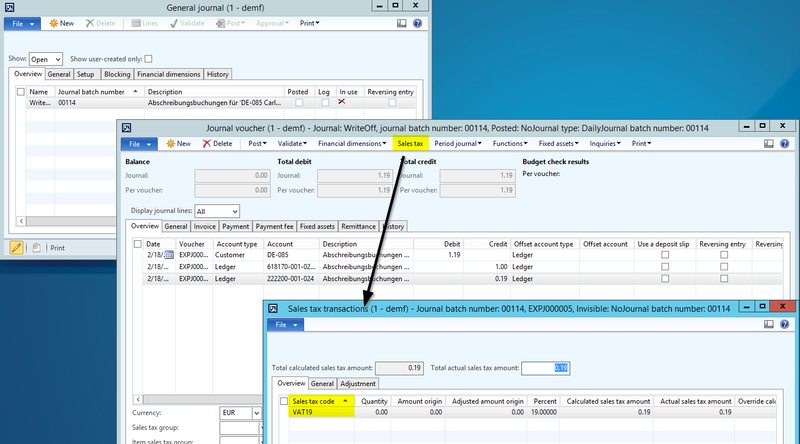 The next illustration summarizes all transactions posted by using this second approach. What you can identify from the posting summary is that the non-deductible VAT account (130850) does now balance and that the VAT does now get recorded and deducted at the right time. 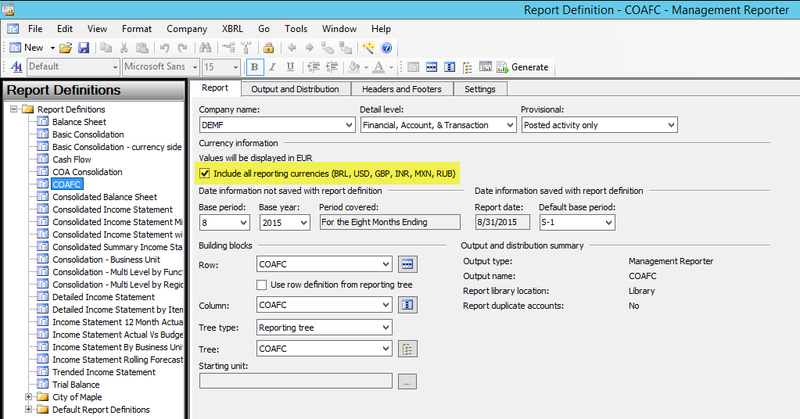 The alternative approach for recording vendor prepayments illustrated in this post shows that using service (“dummy”) items can help overcoming the problems of the standard prepayment functionality and results in correct ledger and tax postings. Despite those advantages I would like to emphasize that this alternative approach comes with a higher risk of errors, as no automatic features exist that ensure e.g. that prepayments can only be deducted once the payment is made. 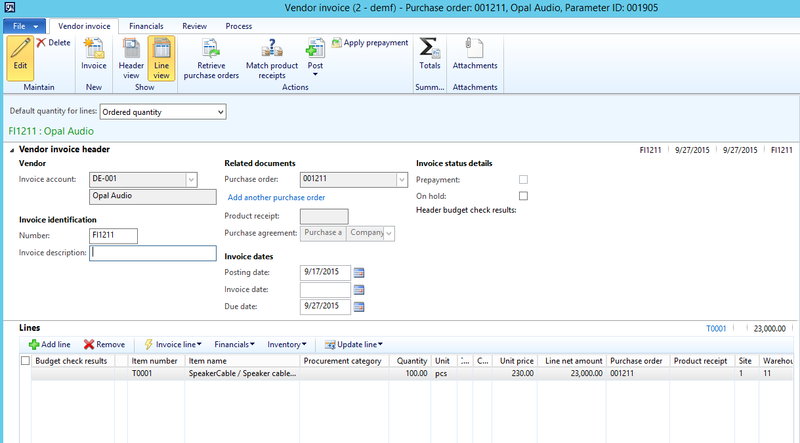 Please also join me in the next post that will show you another approach for recording vendor prepayments. 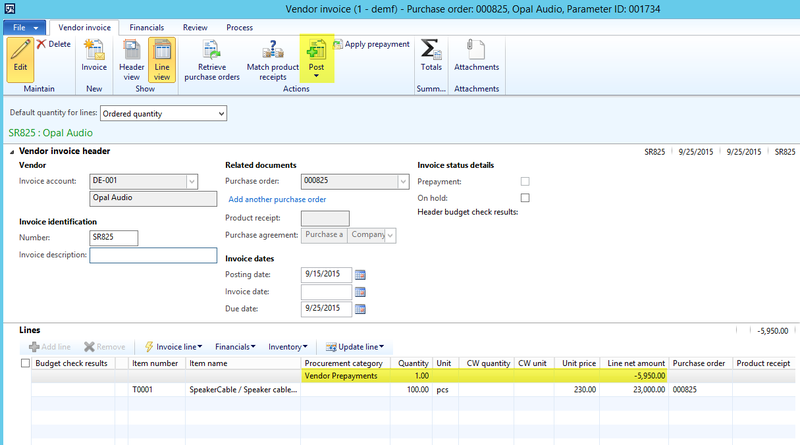 Within this and the following blog posts I will deal with the question how prepayments for vendor purchases can be recorded in Dynamics AX. A special emphasis is thereby made on the tax regulations within the European Union which require that the value added tax (VAT) related the prepayment(s) can be deducted only at the time when the prepayment invoice is paid. For additional information on European tax regulations, please visit this site and/or local government websites. Note: Within this and the subsequent posts, no difference is made between requested and actually paid (realized) prepayments from an accounting perspective. This issue will be addressed in more detail in the last post on vendor prepayments. All transactions recorded for this procurement category are posted on the vendor prepayment account “132200” to incorporate vendor prepayments in the company’s balance sheet. 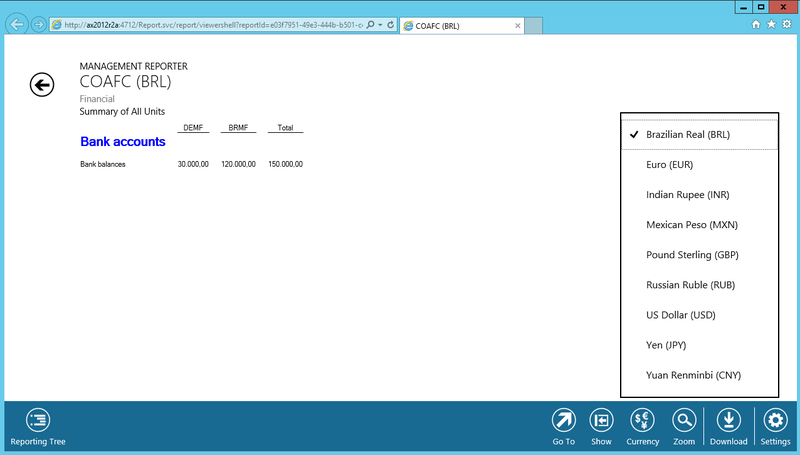 The next screenshot shows you the section of the inventory posting form where the vendor prepayment account needs to be setup. The next setup step requires the establishment of a prepayment vendor posting profile as exemplified in the next screenshot. 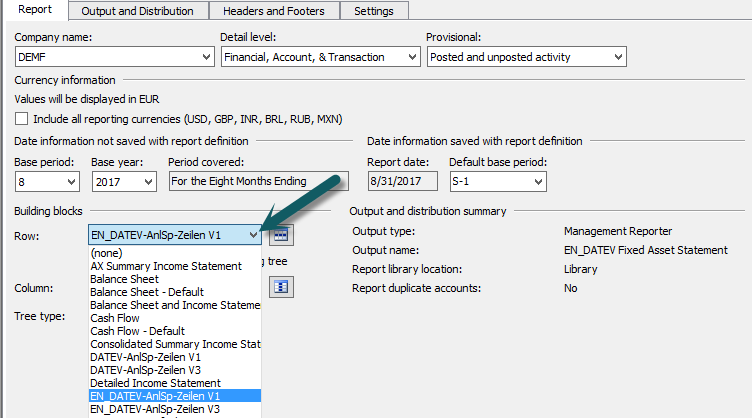 Please note that this prepayment posting profile needs to be setup with a special (“temporary”) VAT ledger account – in my example account no. 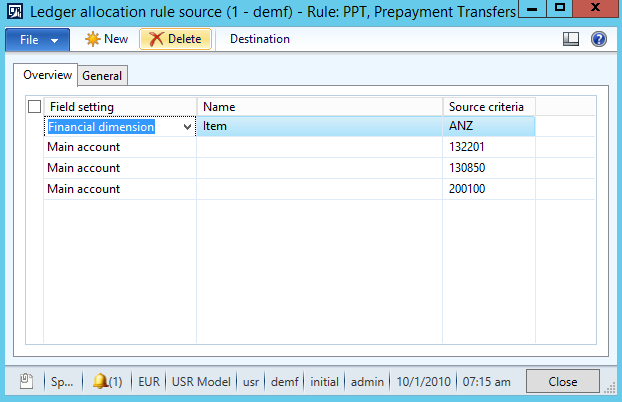 130850 – that records the VAT of the prepayment invoice once it gets posted. As explained before, the VAT recorded on this account cannot be deducted until the payment of the prepayment invoice is actually made. After setting up the prepayment vendor posting profile, you have to make sure that the Accounts Payable parameters are linked to this profile. The last setup required concerns the VAT tax codes, tax groups and item tax groups. Against the background of the non-deductibility of the VAT at the time when the prepayment invoice is recorded, a separate VAT tax code (“InVAT19A”) is setup that records the non-deductible VAT amount posted. I linked this VAT tax code to the ordinary Accounts Payable sales tax group(s) and the “on accounts” (OA) item sales tax group. (Please note that the on account (OA) item sales tax group is setup together with the procurement category shown before). In addition, I connected the VAT tax code “InVAT19A” with the non-deductible tax ledger account no. “130850” via the corresponding sales tax ledger posting group. Finally, I linked the non-deductible VAT tax code “InVAT19A” with the ordinary (deductible) VAT tax code “InVAT19” in the payment sales tax code field. This linkage ensures that we are able to deduct the VAT once the prepayment invoice is paid. The following screenshots summarize the tax setup made. Once all necessary setups are finished, the vendor prepayment process can be performed through the execution of the following four steps. Please note that I recorded the gross amount of the prepayment the vendor asked for [5000 EUR net + 19% VAT (950 EUR) = 5950 EUR]. Also note that the prepayment procurement category needs to be selected in the prepayment form as illustrated in the previous screenshot. 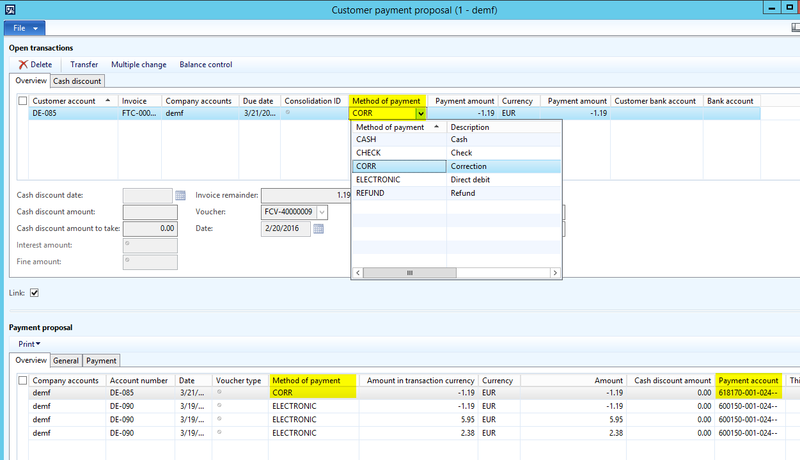 The next step in the prepayment process is posting the prepayment invoice though the corresponding functionality. When posting the prepayment invoice, the prepayment procurement category and the “on account” (OA) item sales tax group automatically defaults, as illustrated in the next screen-print. What you can identify from this voucher is that the tax is recorded on the non-deductible VAT account “130850”. 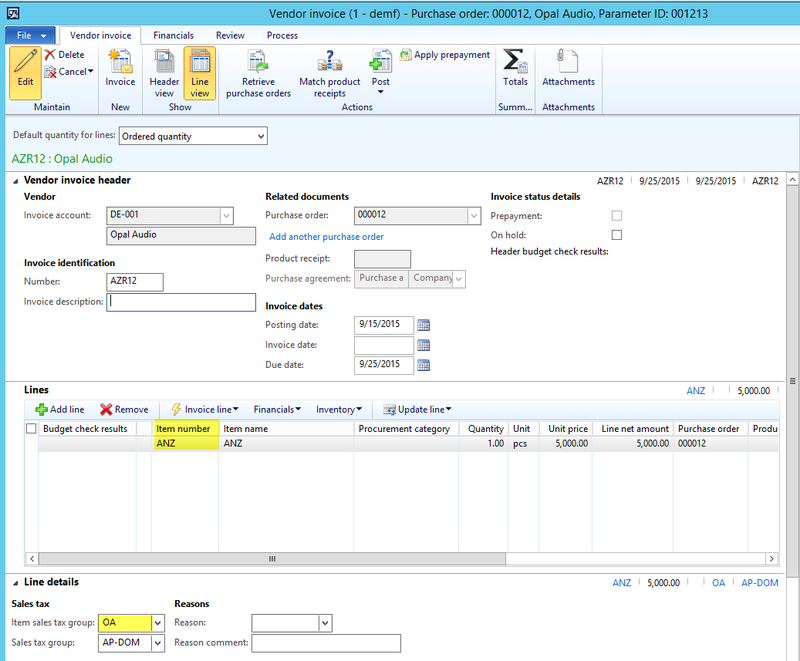 After the prepayment invoice is recorded in Dynamics AX it can be paid via an ordinary vendor payment journal. The only thing you have to look for in this journal is selecting the prepayment check box in the payment tab that automatically changes the posting profile. What you can identify from the previous screenshot is first, the payment of the prepayment amount from our bank account and second, a transfer of the tax amount from the non-deductible VAT account (130850) to the ordinary (deductible) VAT account (130800). 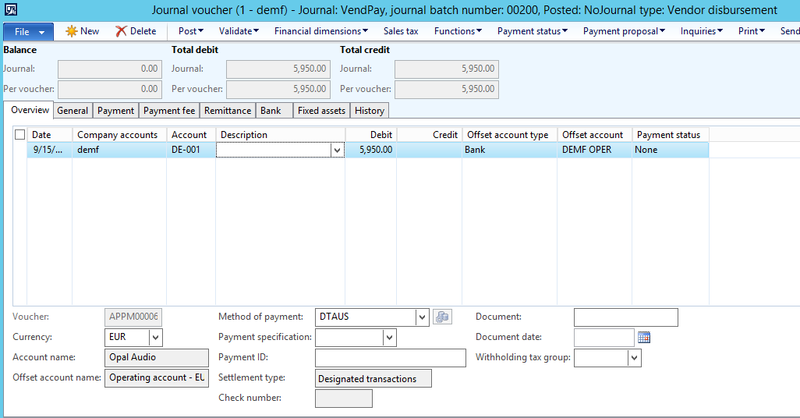 Note: The screenshot at the lower right-hand corner shows the related vouchers generated in addition to the payment made. As the ledger accounts used in this voucher offset each other, they can be ignored here. The last step in the prepayment process is posting the final vendor invoice for the delivery of the goods ordered. When doing this posting you have to ensure that the prepayment made is applied and deducted. The next screenshots illustrate how this application can be made. 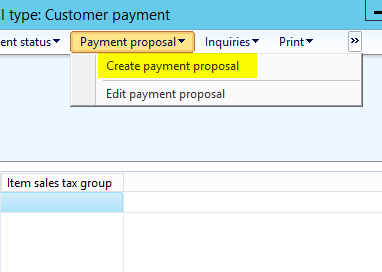 Whether or not the prepayment(s) made are correctly applied can be identified in the invoice line section that shows the prepayments that get deducted from the total invoice amount. The first three lines posted represent the ordinary vendor invoice posted for the total amount of the goods (100 pcs. * 230 EUR/pcs. = 23000 EUR + 19% VAT = 27370 EUR). Please note that the total VAT amount (4370 EUR) is posted on the ordinary VAT account 130800. The last three lines highlighted in yellow color represent the deduction of the prepayment made. 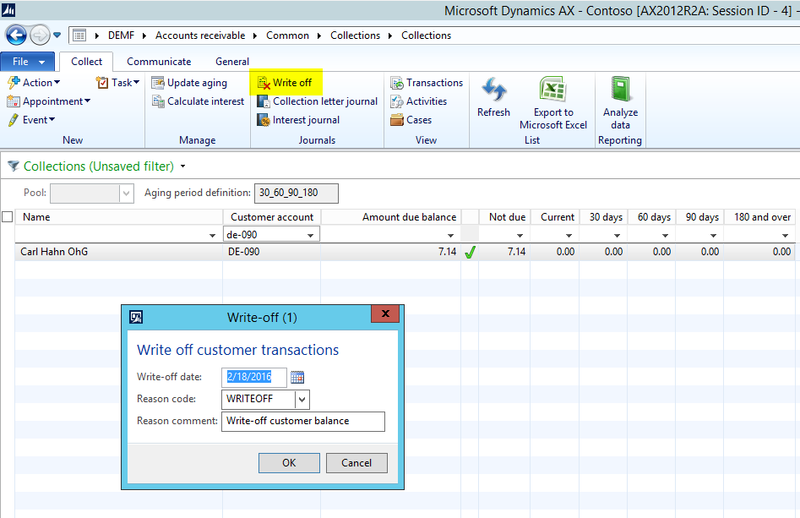 What is interesting (wrong) here is that Dynamics AX uses the non-deductible VAT account (130850) to record the VAT already paid in step 3. In order to highlight the problem with the last voucher, I summarized all transactions created during the prepayment process in the next image. What you can identify from this summary is that the last voucher should credit the ordinary VAT account (130800). Yet, it actually uses the same – (wrong, while non-deductible) – VAT account (130850) that was used when posting the prepayment invoice. As a result, 5320 EUR (950 EUR + 4370 EUR) – highlighted in red color – are posted on the ordinary deductible VAT account no. 130800 that results in a wrong, while too high VAT deduction. At the same time, the non-deductible VAT account no. 130850 still shows a credit balance of 950 EUR. As the previously illustrated standard setup of the prepayment functionality for purchase orders provided a problematic, while wrong outcome, I changed the setup of the procurement category by assigning the ordinary (“full”) item sales tax group as illustrated in the next screen-print. In addition to this change, I also modified the sales tax prepayment account linked to the prepayment vendor posting profile by using the ordinary (deductible) VAT account 130800. After repeating all prepayment process steps, the following vouchers remained. What can be identified from this summary is that the total VAT amount posted and deducted is correct. Yet, the first “ordinary” VAT transaction is already recorded with the posting of the prepayment invoice. From a tax perspective this is too early and can lead to problems with tax authorities especially in cases where prepayment invoices are posted earlier than the final purchase vendor invoice for example due to long transportation times. 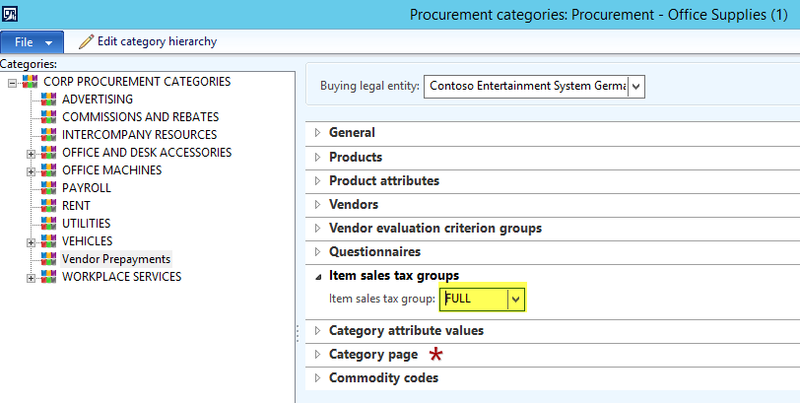 As the previously illustrated alternative setup option leads to a potential tax evasion, I changed the setup of the procurement category once again and linked it with an item sales tax group (“without”) that does not record any VAT. Result: As before, after repeating all prepayment process steps, the following vouchers remained. 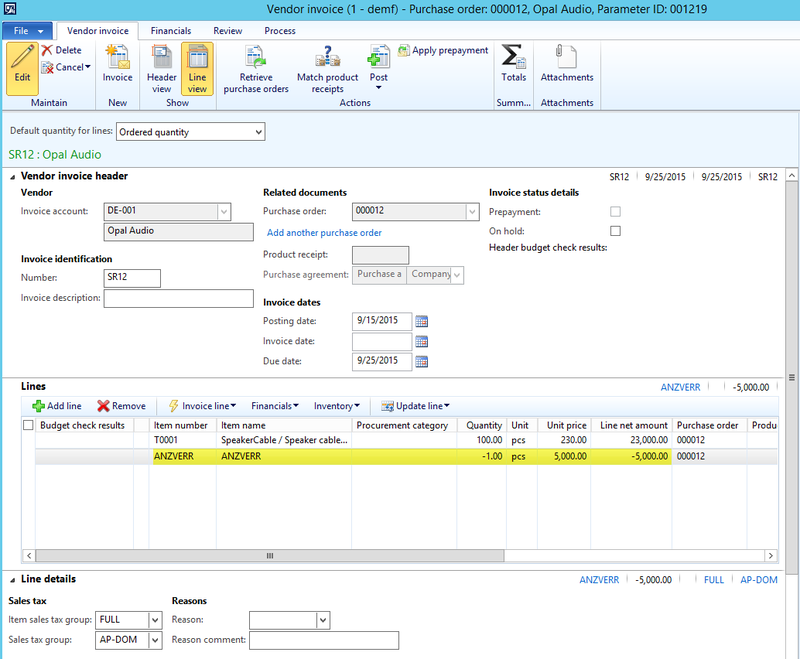 The posting summary illustrated in the previous screenshot shows that the VAT is posted and deducted at the time the final vendor invoice for the purchase order is recorded. This approach can be considered as very conservative and won’t result in problems with tax authorities. Yet, from a financial cash flow perspective this approach can be problematic and easily result in cash flow problems, especially if large amounts are involved. All approaches for recording vendor prepayment illustrated in this post are more or less problematic (wrong). As a result, if your company operates in a VAT environment, I would recommend not using the prepayment functionality available in the purchase order form for recording prepayments. Within the next posts I will show you some alternative approaches that result in correct tax and ledger transactions. Till then.